If you haven’t figured it out by now, I am a total and complete chocoholic. I love just about every food that includes it. 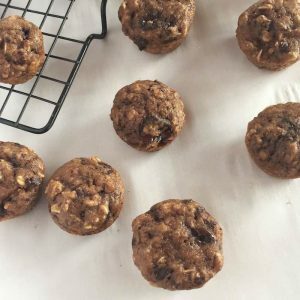 Also true is that I’m a huge fan of making simple recipes that incorporate chocolate (yes please, Chocolate Chip Pecan Breakfast Cookies or feature it as the starring ingredient (hello, Double Chocolate Mini Muffins!). 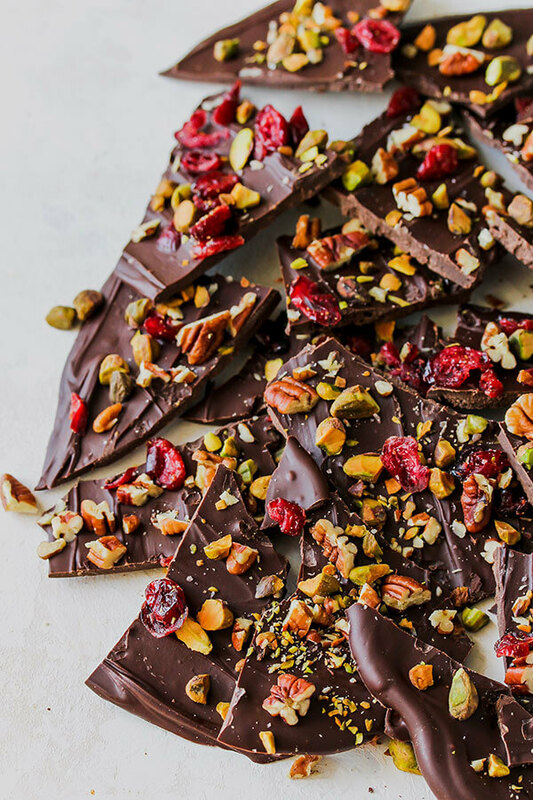 The best thing about this “non-recipe recipe” is that you can use whichever ingredients you have on-hand to stud the dark chocolate bark. 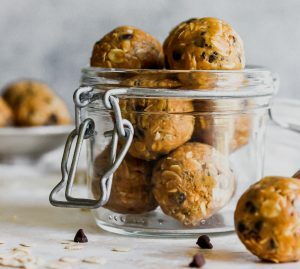 I usually aim for a nut and some type of chopped dried fruit with a sprinkle of good quality salt but you can always get even more creative with nontraditional ingredients. For example, the Meal Makeover Moms use hemp seeds and crystallized ginger in theirs, Erika Rax likes fresh rosemary in her gorgeous recipe, and the kitchn highlights the best of spring by including edible flowers. 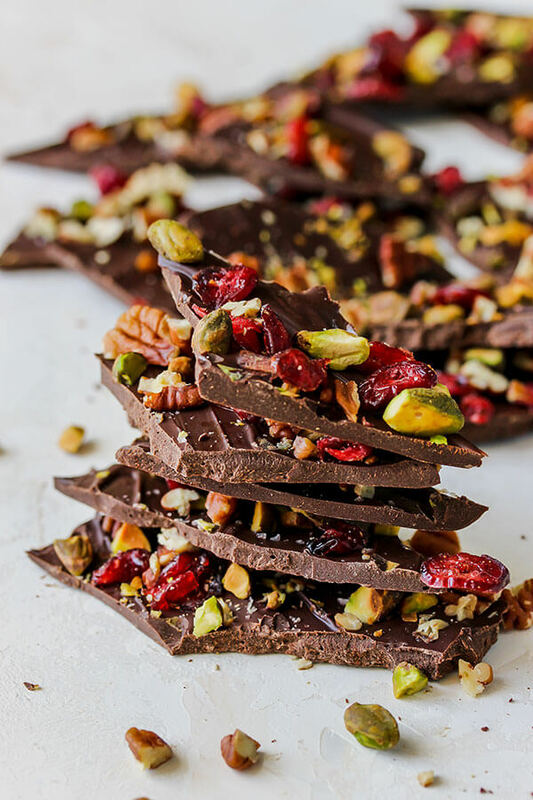 Simply start by melting a bag of high-quality dark chocolate chips in the microwave or over a double boiler. I prefer the microwave method for ease but it is important to stay close and stir often so the chocolate won’t scorch. Simply microwave in 30 second increments over medium heat until melted (this usually takes 1 to 2 minutes depending on the strength of your microwave). Next, spread the melted chocolate on parchment paper. Drop your toppings onto the melted chocolate. The first time I made this recipe I was out of parchment paper so I spread the chocolate on foil. Unfortunately, it never set up (hardened) so I would strongly suggest using parchment paper. While the chocolate is still wet/melted, sprinkle with your desired toppings. As a rule of thumb, I use about a 1/2 cup toppings to 1 bag of chocolate. This is where you can get creative with flavor combinations! Allow at least 2 hours for the chocolate to cool. If you live in the south like I do where life is a constant state of humidity or if it is raining on the day you make your candy, expect the chocolate to take longer to set up. I actually had the best luck finishing it off in the refrigerator (but refrigerating is a personal preference). 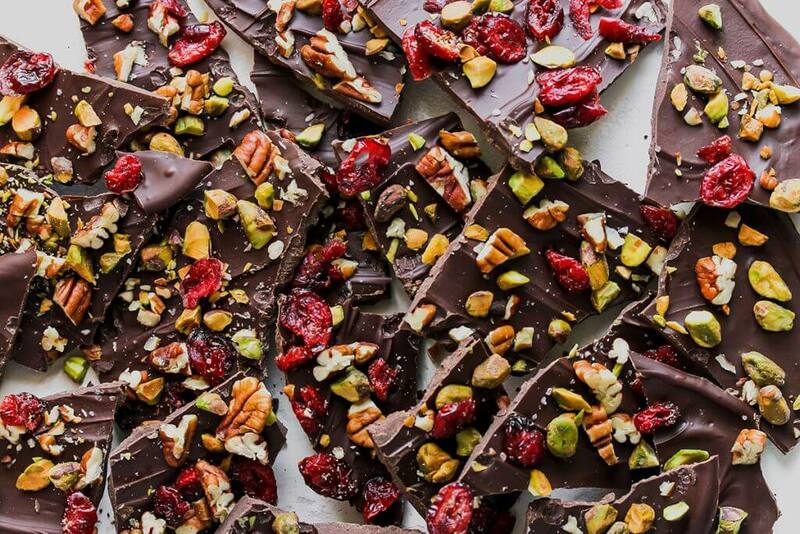 Once the chocolate is dry, break it into bite-sized pieces and store in an airtight container for up to 3 days (if you can really go 3 days without eating all of it!). Which Flavors Would You Add? 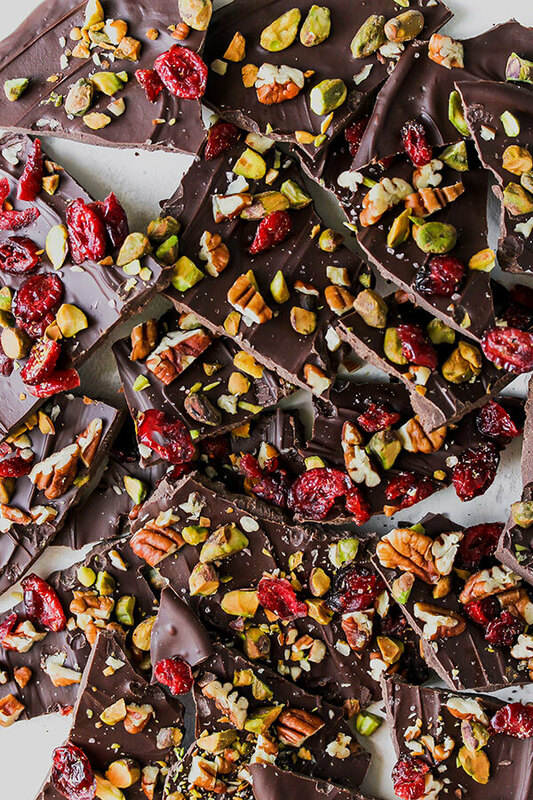 Which flavor pairs would you top on your dark chocolate bark? 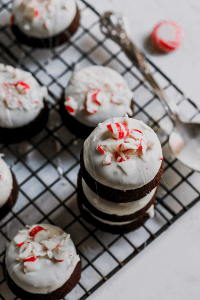 I’m thinking crushed peppermint would be delicious or maybe toasted coconut… The options are endless! Share your faves in the comments! I’m always looking for new flavor combos. Melt dark chocolate chips in the microwave on medium heat 2 minutes or until melted, stirring every 30 seconds. 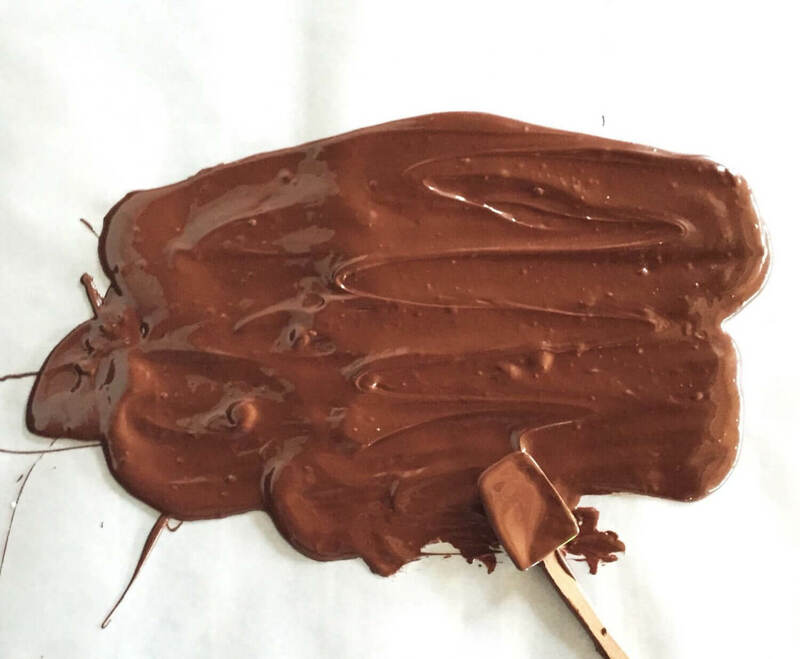 Pour melted chocolate onto a piece of parchment paper and smooth to 1/8-inch thickness. Top evenly with cherries, pecans, and fleur de sal. Allow to dry (2-4 hours) then cut or break into bite-sized pieces. 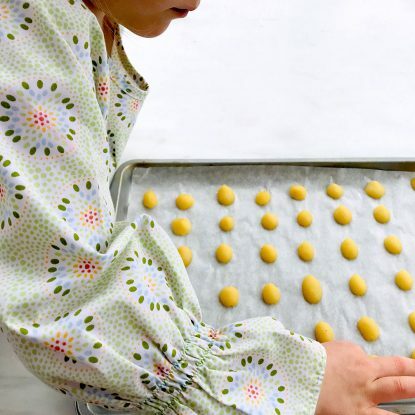 Simple and impressive, this sweet & salty candy is so easy to make and can easily be adapted to use whatever ingredients you have on-hand. 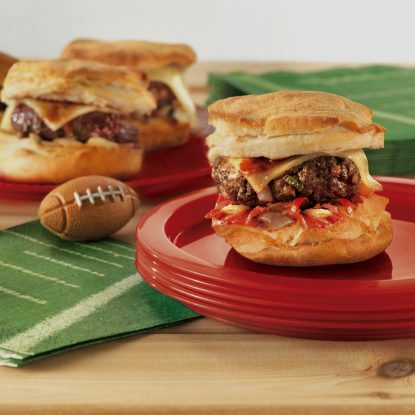 It is sure to become a crowd pleaser! 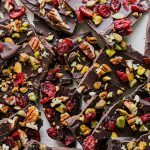 I love using vibrant colors in bark – this looks fantastic and I know it tastes equally so! It’s so yummy! 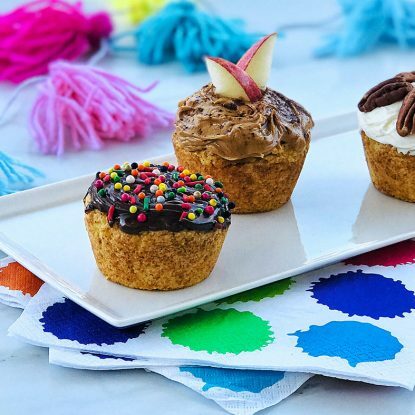 I agree that using vibrant colors really makes it a stand-out gift or dessert! This dark chocolate bark looks awesome! I would not be able to eat just one! I had to hide it and then send it to work with my husband. So delish!